Parrot ownership, even with smaller birds like budgies, can be quite messy. They love to throw seeds and hulls all over the place, as well as feathers, pieces of toys, anything they can shred…essentially anything a bird can be messy with, it will be quite delighted to do so. One of Toby and Kelly’s favorite pastimes is to throw whatever they can lift and then watch it fall. To deal with the resulting mess we deploy an army of 3 vacuums, each with a specific purpose. Roomba goes out every weekday between 2pm and 3pm and vacuums as much of the house as it can before going back to base. What’s great about this is it means we don’t need to vacuum the entire house every day, and since it’s scheduled for mid-afternoon, we humans don’t have to listen to it work. The downside is that it can’t go where the cages are because there’s a small step up between hard wood and tile floors. Even if it could get up there is wouldn’t work out, I tried Roomba in their area once and the vacuum hit the cage so hard that it moved. There’s no way I would subject the parakeets to that every day! It does drive a foot or two away from their cage and they hustle over to the side and yell at it until it goes away, which is cute, and also a nice common enemy for them to bond over. Although it can’t get under their cage Roomba takes the edge off of our duties as budgie mess does not tend to stay in one spot. Even on days where they haven’t been out yet I’ll come home to find feathers in the bedrooms. The iRobot Roomba 650 Robotic Vacuum Cleaner does take some care to maintain, we’ve had ours for many years, you’ll need to invest in replacement parts, like brushes and filters, and you do have to clean it weekly at a minimum. I believe we’ve even had to replace the motor on ours. It can also be annoying, if you’ve left any doors ajar it will trap itself and just keep going for hours/until the battery runs out. It’s also not very smart and might go vacuum the same room every day for a week straight. Even considering the downsides, I think Roomba is a valuable addition to our arsenal. A few days into having Toby with us we realized we needed to have a dedicated bird vacuum that we could use conveniently every day in the cage area and kitchen. It had to be lightweight and easy to store but have really good suction and capacity. We started out with a dust buster but that wasn’t really cutting it for getting into crevices and all the way under the cage, and it stopped holding a charge after just a month or so. I have a feeling it just wasn’t up to the herculean task of cleaning up after birds. We ended up purchasing the Shark Rocket Ultra-Light Upright (HV302) and it is fantastic. It’s corded, which I thought would annoy me at first, but we just keep it tucked out-of-the-way behind a door and it stretches where it needs to go. The attachments are awesome for getting under the radiators and it picks up everything as it should. It’s bagless and the canister is see-through. I find that we can go a couple of weeks without emptying. We run this every day in the dining area where the cage it and usually extend into the kitchen as well as the hallway next to the cage. It only takes a few minutes a day but makes a huge difference between relatively clean floors versus tracking seeds and feathers everywhere. This vacuum is the big gun. It has an array of attachments, including an upholstery tool that will pull any tiny speck of dirt out of your couch. The canister pops off the base so it can be carried easily around the house and the smaller head attachment is good for both hard surface floors and carpets. Against with a clear cylinder canister it’s easy to tell when you need to empty and so satisfying to watch it fill up. Unlike our daily vacuums, this guy only comes out on the weekends when we clean house, it is extremely thorough and powerful and easy to maintain. Recently I dropped about 5 pounds of seed and pellets on our kitchen floor and after salvaging what I could we vacuumed up the rest, the Shark made quick work of it and probably would have been happy to chow down on the full amount. The shark also does a great job during heavy molting times and has really good suction for getting tiny feathers from under tables, chairs, couches and oh just everywhere (since everywhere is where they are!). Depending on your needs you can’t go wrong with any of these vacuums; I think all three are a great system to keep parakeet (and everyday human) mess under control. 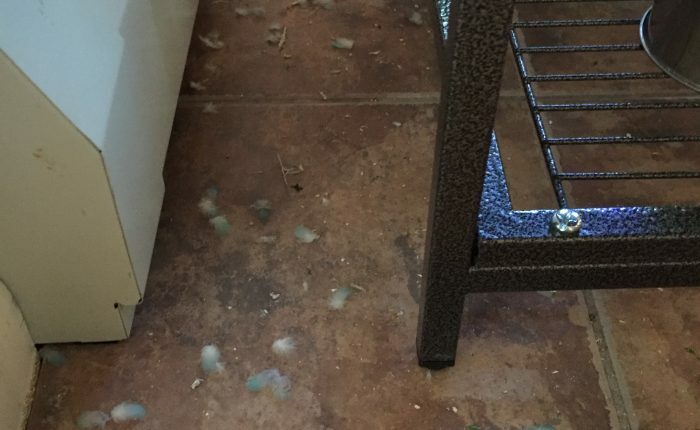 One big note about safety, please don’t ever vacuum with your budgies out of the cage. I saw a terrible story once about a parakeet that got sucked up in a vacuum, thankfully it survived with medical intervention but hat’s a vet bill that’s pretty easily avoided by keeping birds at home when vacuums are out. I’m going to assume that most parakeets are not huge fans of the vacuum anyway and probably feel safer in their cages instead of battling the great noisy beast! I just purchased the Shark Rotator Professional from your link. Oooh, a parakeet sucked up in the vacuum?! That must have been terrifying! I can’t believe it takes so much to keep clean with just a few little birds – I guess they really love messes, huh? We have a Shark and love it! I’m tempted to get a Roomba. They look fun. I always wanted a bird but then realized they make a lot of noise. lol But I do have to kids (rugrats) and because of them we purchased a Shark. I would like to get a roomba someday. I actually wanted a Shark for a long time. I always wondered if it was worth the money. This looks like it’s pretty powerful and precise. Thanks! 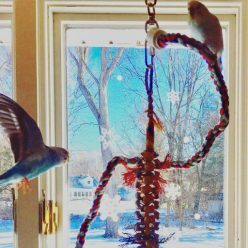 My kids have been begging us for some birds for their pets – budgies – and I’ve always said no way because of the mess, but they seem to be so keen on the idea. Thanks for outlining what kind of tools I might look into getting to make this a bit more of a feasible option for our family. It’s really important to have a reliable vacuum cleaner when you have pets at home. It’s a convenient way to clean up, especially all the unwanted hair/feathers, plus the mess. I have a dog and a vacuum is a necessity at home. I think it’s easier to have one that you can control instead of the robot ones that are becoming so in these days. Very interesting to read. We own a dyson but if it ever breaks I will consider one of yours. Initially, I was thinking to buy iROBOT but I heard few drawbacks as you mentioned it keep cleaning the same room and if it gets obstacle then keep running until battery die. Now I am thinking to buy Shark uplift. Looks like it did a great job. I’ve been wanting an iRobot but I haven’t bought one yet. I did just get a Shark vacuum though and it’s wonderful. I owned a shark years ago and did like it. I know won’t give up my dyson. I love it. Omg I want a shark super bad!!!! I have two cats and my house gets covered in fur!